Tickets are available online for singer and songwriter Jessie J, who will perform for the spring concert sponsored by EXCEL Campus Activities. The British artist will perform at 8 p.m. Tuesday, Feb. 10, at Texas Hall. She is recognized for an unconventional musical and performance style, mixing soul vocals with contemporary R&B, pop, electropop, and hip-hop beats. Her hits include Price Tag, Domino, Who You Are, Nobody's Perfect, and her latest release, Bang Bang. Tickets are $15 with student ID and available at utatickets.com. Tickets are $25 for general admission and $20 for UTA faculty and staff. Theoretical physicist Michio Kaku presents his thoughts on "Physics of the Future" for the next Maverick Speakers Series event. His lecture is at 7:30 p.m. Thursday, Feb. 19, in Texas Hall. An autograph signing will follow the lecture. Tickets will be available beginning at 10 a.m. Tuesday, Jan. 20. Free general admission tickets and preferred packages are available at utatickets.com. For VIP packages, contact Mark LaVelle at mlavelle@uta.edu or 817-272-5235. Dr. Kaku is one of the most widely renowned contemporary figures in science. His particular area of specialty is Einstein’s unified field theory, which Kaku is attempting to complete. He is also known for his work in predicting trends that affect business, commerce, and finance. The Henry Semat Chair in Theoretical Physics at the City University of New York, Kaku has written several best-selling books and is the public face of the Science Channel. Upcoming speakers are former San Antonio mayor and former Secretary of Housing and Urban Development Henry Cisneros on March 26 and sports broadcaster Bob Costas on April 13. UT Arlington is among the top 50 universities in the nation for earning a master’s degree in education or nursing online, according to U.S. News & World Report’s Best Online Graduate Programs rankings for 2015. The College of Education's online program ranked No. 30 among 252 schools surveyed, up from its 166th position last year when 238 schools were surveyed. The College of Nursing and Health Innovation's online program ranked No. 31 among 133 schools surveyed, up 34 spots from last year. Read more about the top 50 online degree honors. Meighan Burke, assistant director for student orientation, gives directions to Micah Stewart, journalism sophomore, at an orientation for transfer students last week. Visitors to the Architecture and Fine Arts Library and the Science and Engineering Library will show their MavID on entering and exiting. The Central Library implemented a card swipe system in September. The fourth and fifth floors have been designated as quiet floors. The third floor, previously a quiet floor, has changed to a collaborative setting. Graduate students have their own reserved study space on the second floor of the Central Library. Students must swipe their student ID to enter the room. Space is first come, first served. The Textbook Project—a program offering a selection of 1000- and 2000-level textbooks that can be checked out for two hours—has returned for the spring 2015 semester. See the list of available books. Single copies of select textbooks are stored in the reserves area of Central Library or the Science and Engineering Library, depending on the subject. The textbooks must remain in the library and copying is permitted. Electronic copies of textbooks are not available. Learn more at the service desk at the libraries. 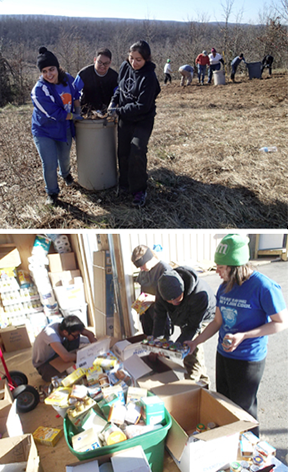 Many students spent their winter break helping others for the Alternative Winter Break program. Top, from left, Niyousha Pavachi, physics sophomore; Devin Nguyen, English senior; and Laura Deluna, nursing sophomore, carry a barrel of debris while helping a man clean his land near Conway, Ark. Bottom, from left, Rocky Sonemangkhara, nursing senior; Novella Landau, mechanical engineering senior; Fernando Navarro-Lopez, biology sophomore; and Miriam Guerrero, criminology sophomore, sort through items donated to a church food pantry in Mayflower, Ark. The Alternative Breaks program will take volunteers to the Gulf Coast of Mississippi during spring break. Portions of Lot 39 at First Street and Spaniolo Drive and Lot F11 just north of the E.H. Hereford University Center and will be reserved Thursday, Jan. 22, for a special event in the University Center. Parking options include the College Park District garages. The College Park District parking garages will be used for the Varsity Spirit Cheer event parking at College Park Center beginning at 6 a.m. Saturday-Sunday, Jan. 24-25. Parking staff will collect a fee during this time. Traffic in the area will be heavy, so make alternate arrangements for parking. Submit nominations at uta.edu/outstandingadvisor by Monday, Jan. 26. Male-identifying students, faculty, and staff are invited to participate in the inaugural Men and Masculinities Week, hosted by Multicultural Affairs. The social networking event is 12:30-2 p.m. Thursday, Jan. 29, in the Carlisle Suite of the E.H. Hereford University Center. RSVP by 5 p.m. Thursday, Jan. 22, to ramirezss@uta.edu. Stay abreast of urgent news through the MavAlert Emergency Notification System. The MavAlert system rapidly notifies faculty, staff, and students in the event of a campus emergency via registered email addresses and text message devices. Verify your contact information at uta.edu/mymav. The next system-wide test of the MavAlert Emergency Notification System is at 12:30 p.m. Wednesday, Feb. 4. Safe and Sound in Maverick Country offers comprehensive information about safety precautions implemented by UT Arlington, tips for staying safe while on campus, procedures to follow in the event of an emergency, and important contact information. The University closely monitors severe weather forecasts and will notify all faculty, staff, and students should local conditions affect the status of the University, including classes, programs, events, and activities. There are numerous ways to access official information about the status of the University. All announcements will be communicated via University email in MavWire EXTRA (faculty and staff) and TrailBlazer EXTRA (students). Additionally, notices will be posted on the University's home page, recorded information will be available on the University's Emergency Information Hotline at 1-866-258-4913, and announcements will be sent to local media outlets. Information also will be available on the University’s Twitter and Facebook pages. Represent your student organization at upcoming campus events. Activity Fair Day is Wednesday, Jan. 28, in the E.H. Hereford University Center; register online. 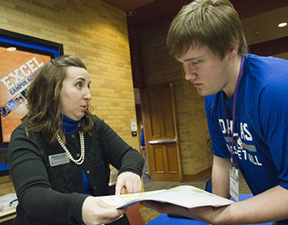 Preview Days are set for Saturday, Feb. 7, and Saturday, April 18; register online. Deadline for new students and students not enrolled in the fall to submit record of meningitis vaccination if under 22 years old. Late registration ends for spring term. Grades for the winter intersession are official and available in MyMav. Grades are not complete until all academic standing and drops are complete. Grades are posted as official on the Office of Admissions, Records and Registration website and on MyMav. The last day to remit evidence of your vaccination without risk of being dropped is the first class day, today, Tuesday, Jan. 20. You can still make plans to register for the spring 2015 term. The schedule of classes is available on the MyMav portal page. Students can add and swap classes through the last day of late registration, Friday, Jan. 23. Two Hungarian-born artists share space in both the literal and metaphysical sense in Sharing Space: Gyorgy Beck and Sylvia Plachy at The Gallery at UTA. The exhibit runs Tuesday, Jan. 20-Saturday, Feb. 14. Longtime friends, Beck and Plachy collaborated with their individual works that demonstrate a shared poetic approach. Shown above is Plachy's Homeless in Chelsea. Beck, a visiting senior lecturer in the Art and Art History Department, creates films and photo-based works by digitally combining and reworking imagery, and experimenting with printing techniques and surfaces to convey his thoughtful, meditative vision. Plachy, an award-winning photographer based in New York, captures humanistic vignettes that express her unique viewpoint through subtle choices of subject and focus. 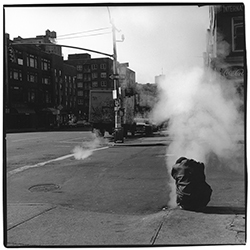 Plachy gives an artist's talk 12:30-1:30 p.m. Thursday, Jan. 29. An opening reception is 5-6 p.m. Friday, Jan. 30. Both are in the gallery in the Fine Arts Building. Faculty Bass Recital with Jack Unzicker Jack Unzicker, assistant professor of double bass, performs. Free. 7:30 p.m., Irons Recital Hall, Fine Arts Building. Music. Art of Peace Concert An international expression of music and dance. Performances by mariachi and marimba bands, Japanese drummers, crane dancers, and more. Proceeds benefit Rotary Club educational and humanitarian programs. Tickets $25 general admission. VIP tickets $75 include designated seating and reception after concert. For tickets, contact Dan Morales at 817-994-7575 or dan.dmorales@gmail.com. 6:30 p.m., Irons Recital Hall, Fine Arts Building. Rotaract Club of UTA. Guest Violin Recital Alessandra Jennings Flanagan of the Fort Worth Symphony Orchestra performs. Free. 7:30 p.m., Irons Recital Hall, Fine Arts Building. Music. Engineering Speakers Series Karen C. Kabbes, president of Kabbes Engineering, presents "Water Resources: Sustaining Quality and Quantity or What Will Be the State of Our Water Resources When Today's Students Rule the World?" 5-7 p.m., Room 601, Nedderman Hall. Engineering. For the win: Lonnie McClanahan, top, and Erick Neal, bottom, contributed their talents to the Mavericks' 66-55 win over Texas State on Monday. The team travels to Louisiana-Monroe on Thursday, Jan. 22, and Arkansas-Little Rock on Saturday, Jan. 24. The men’s basketball team ended the game on a 14-2 run to defeat rival Texas State 66-55 on Monday night at College Park Center. Senior Greg Gainey led the way with 12 points, including a 3-pointer that put the Mavericks ahead to stay with just under three minutes to play. Senior Lonnie McClanahan added 11 points. With the win, UTA improves to 4-3 in the Sun Belt Conference and 10-7 overall. The Mavericks travel to Louisiana-Monroe on Thursday, Jan. 22, and Arkansas-Little Rock on Saturday, Jan. 24. The upcoming men's basketball game between UT Arlington and Louisiana-Lafayette on Saturday, Feb. 7, has been selected as the first of two "wild card" games to be carried by ESPN or ESPN2. The game will now tip at 1 p.m. from the Cajundome in Lafayette, La. The network will be announced one week in advance. UTA and Louisiana-Lafayette are tied for fourth in the Sun Belt Conference standings. The game will be the first of two meetings this season between the Ragin' Cajuns and Mavericks. It will also be the first meeting between the two teams since the 2014 Sun Belt Conference Men's Basketball Championship quarterfinals, a 91-85 win for the Ragin' Cajuns en route to the tournament title. A late comeback came up short as the Mavericks lost 60-53 to Texas State on Monday at College Park Center. Junior LaShanda Green led UTA with a game-high 15 points, and senior Chaun Williams scored 14, all in the second half. Freshman Rebekah Van Dijk added seven points and 13 rebounds. The loss drops the Mavericks to 3-4 in Sun Belt Conference play and 9-7 overall. Next up are road games at Louisiana-Monroe on Thursday, Jan. 22, and Arkansas-Little Rock on Saturday, Jan. 24. A trio of Mavericks were crowned individual champions at the Texas A&M Team Invitational, highlighting the first meet of 2015 for UT Arlington’s men’s and women’s track teams. The men placed fourth out of nine teams with 76 points, while the women finished fifth among the same number with 53 points. Texas A&M won the men’s team title, while Baylor claimed the women’s crown. On the women’s side, Gabriela Alfonzo was victorious in the 3000 meters with Katelyn Hayward finishing in third place. Chineme Obikudu grabbed third in the triple jump, and Hannah Nilsson was the runner-up in the mile. For the men, Michael Guerrero won the 5000 meters edging out runner-up teammate Eric Ojeda. Roland Sales tied for first in the high jump. Emil Blomberg finished third in the 800 meters, while Craig Lautenslager took the bronze in the 3000 meters. The Mavericks will compete in the Mark Colligan Memorial on Saturday, Jan. 31, and the Varsity Apartments Invitational on Saturday, Feb. 14, prior to the Sun Belt Conference Indoor Track and Field Championships set for Monday-Tuesday, Feb. 23-24, in Birmingham, Ala. The UT Arlington men's and women's tennis teams had a solid spring opening Saturday at the UTA Tennis Center. The men beat the University of Incarnate Word by 5-2, and the women came up just short against the Missouri Tigers with a 4-3 final score. Both the men and women are set to compete in 17 non-conference matches throughout the spring season. The men open Sun Belt Conference play Sunday, Jan. 25, against the Troy Trojans at the UTA Tennis Center. The women’s team has a few weeks before its SBC opener on Friday, March 20, at Louisiana-Monroe. Two-time World Series champion Hunter Pence of the San Francisco Giants is among the inductees in the 2015 UT Arlington Athletics Hall of Honor class. The Hall of Honor ceremony begins at 6:30 p.m. Friday, Jan. 30, in the Bluebonnet Room of the University Center. The 2015 Hall of Honor inductees are Pence (baseball), Elston Cawley (men's track and field), Valeria Whitfield (women's volleyball), Mike Stamps (football), and the 1996-2000 men's track and field teams. Individual tickets are available for $50 at utatickets.com. Reservations are due by Wednesday, Jan. 21. Contact Kimberley Jardine at kjardine@uta.edu or call 817-272-0694 for questions or to reserve a table near an inductee.